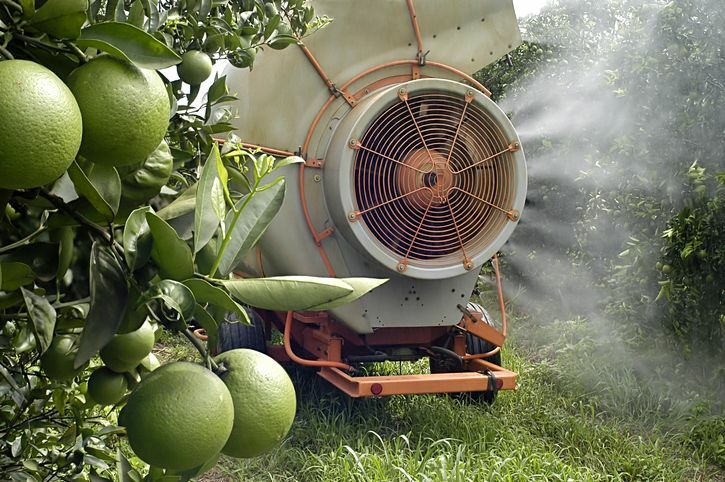 Growers across the country are excited about a new pesticide additive that is being tested on a citrus grove in Florida. Maher Damak, a 27-year-old scientist has a solution to make pesticides stickier, and therefore allow us to use far less of them. Many plants are hydrophobic, or water-repelling and pesticides are mostly water-based, so when they are sprayed onto plants, the droplets either bounce or roll off the surface. Considering more than 5.5 billion pounds of pesticide are used worldwide each year (including 1 billion pounds here in the United States) a solution is imperative. Farmers use many pesticides, and usually, spray 50 to 100 gallons per acre depending on which kind of pests or diseases they have in a year. Only 2% of the pesticides actually stay on the plant. Helping protect plants is important, but it is crucial to remember that it also leaches into groundwater as runoff, contaminating drinking supplies, as well as carried away by wind where it settles on nearby homes, schools, and playgrounds. In fact, researchers have found decades-old pesticide particles as far away as Antarctica, which suggests our entire planet is currently covered in the stuff. Considering pesticides account for almost half of production costs, there is a financial as well as an environmental incentive for farmers to adopt the new technology. Pests account for approximately 40% of losses in global agricultural production. This solution should help increase yields by taking the number of pesticides used per acre from 50-100 gallons down to just 10, changing the bottom lines for growers across the world. After a quick and inexpensive retrofit of pesticide applicators, whether handheld or tractor-mounted, farmers can use significantly less pesticide in their fields without harming their harvest. This entry was posted in Pesticide and tagged Florida Pesticide, Pesticide, Pesticide Applicator, Pesticide Course, Pesticide news.